Nevus of Ota is a dermal melanocytosis originally described by Ota and Tanino in 1939. Clinically, nevus of Ota is distributed along the ophthalmic and maxillary divisions of the trigeminal nerve and presents as a blue or gray patch on the face. Around 50% of cases occur at birth, while the remaining occur during puberty and adulthood. Initial hyperpigmentation may present as light in color with continued hyperpigmentation as the individual ages. In addition to the pigmented macule observed on the skin, there have also been rare cases involving ocular and oral mucosal surfaces. [2, 3] See the images below. Nevus of Ota. 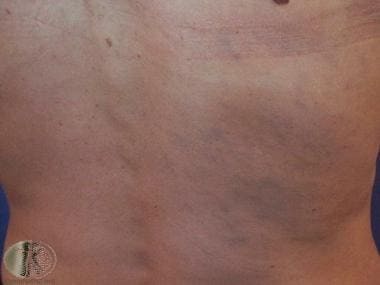 Courtesy of DermNet New Zealand (http://www.dermnetnz.org/assets/Uploads/lesions/ota2.jpg). Nevus of Ota. Courtesy of DermNet New Zealand (http://www.dermnetnz.org/assets/Uploads/lesions/ota.jpg). Nevus of Ito, initially described by Minor Ito in 1954, [2, 3, 4] is a similar dermal melanocytic condition like nevus of Ota, differing in distribution. Nevus of Ito is usually found distributed along the posterior supraclavicular and lateral cutaneous brachial nerves of the shoulder. Nevus of Ito often occurs in association with nevus of Ota in the same patient but is much less common, although the true incidence is unknown. From a pathophysiological standpoint, both nevus of Ota and Ito result from failed migration of melanocytes from the neural crest to basal layer of the epidermis. See the image below. Nevus of Ito. 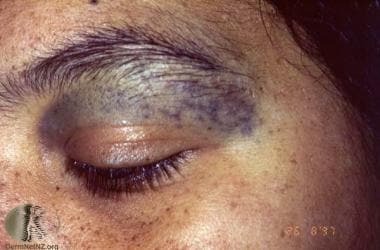 Courtesy of DermNet New Zealand (http://www.dermnetnz.org/assets/Uploads/lesions/melanocytosis-ito.jpg). Additionally, the Medscape article Melanocytic Nevi may be of interest. The etiology and pathogenesis of nevi of Ota and Ito are not known. Although unconfirmed, nevus of Ota and other dermal melanocytic disorders, such as nevus of Ito, blue nevus, and Mongolian spots, may represent melanocytes that have not migrated completely from the neural crest to the epidermis during the embryonic stage. The variable prevalence among different populations suggests genetic influences, although familial cases of nevus of Ota are exceedingly rare. The two peak ages of onset in early infancy and in early adolescence suggest that hormones are a factor in the development of these conditions. Schwann cell precursors have been shown to be a source of melanocytes in skin. The observation of dermal melanocytes in close proximity with peripheral nerve bundles in nevus of Ito suggests that the nervous system is a factor in the development of nevus of Ito, although the true pathogenesis remains unknown. One theory regarding the pathogenesis of nevi of Ota and Ito. It has been demonstrated that most nevi and melanomas are associated with mutations in the BRAF and NRAS genes of the MAP kinase pathway. [7, 8] However, blue nevi and nevi of Ota and Ito do not possess these mutations. Instead, it has been discovered that the melanocytes present in these lesions often contain a mutation in a G-coupled protein gene, GNAQ. This mutation causes the G-coupled protein to be constitutively turned on, resulting in increases in the melanoblast pool. These melanoblasts then migrate during embryogenesis to the skin, the uvea, and/or the meninges, creating the various manifestations of Nevus of Ota. [9, 10, 11] This would explain the association between nevus of Ota and uveal and leptomeningeal melanocytosies. GNAQ mutations have also been shown to underlie other cutaneous disorders, including phakomatosis pigmentovascularis (of which melanocytosis may be a feature),  nevus flammeus,  and Sturge-Weber syndrome. Nevi of Ota and Ito occur most frequently in individuals of Asian descent, with an estimated prevalence of 0.2-0.6% for nevus of Ota in the Japanese population. Nevus of Ito is less common than nevus of Ota, although the true incidence is unknown. Studies have shown prevalence in other ethnic groups including Africans, African Americans, and East Indians. Nevi of Ota and Ito are uncommon in whites. Females are shown to be affected five times more than males, with the male-to-female ratio is 1:5 for nevus of Ota. The ratio for nevus of Ito is unknown. The initial presentation of both nevus of Ota and Ito occurs in infancy, with as many as 50% of nevus of Ota cases present at birth. Nevus of Ota may also present itself during adolescence. Lesions may display progressive hyperpigmentation with age, and, without treatment, lesions remain permanent. It is important to note the psychosocial impact that Nevus of Ota can have on those affected, as disease progression can cause facial disfigurement. In rare cases, melanoma, which can be life threatening, has been reported to arise from nevus of Ota. Glaucoma also has been associated with nevus of Ota. Recurrence may also occur with incomplete removal of lesions. It is important that patients be made aware of the risk associated with the development of glaucoma as this may progress to vision loss. Periodic follow-up visits with an ophthalmologist should be encouraged. Despite there being a rare risk of transformation into malignant melanoma, patients should be encouraged to report any changes in size and/or color to the lesional areas. Solanki J, Gupta S, Sharma N, Singh M, Bhateja S. Nevus of ota"- a rare pigmentation disorder with intraoral findings. J Clin Diagn Res. 2014 Aug. 8 (8):ZD49-50. [Medline]. Franceschini D, Dinulos JG. Dermal melanocytosis and associated disorders. Curr Opin Pediatr. 2015 Aug. 27 (4):480-5. [Medline]. Que SK, Weston G, Suchecki J, Ricketts J. Pigmentary disorders of the eyes and skin. Clin Dermatol. 2015 Mar-Apr. 33 (2):147-58. [Medline]. Ito M. Studies on melanin XXII. Nevus fuscocaeruleus acromio-deltoideus. Tohoko J Exper Med. 1954. 60:10. Mohan RP, Verma S, Singh AK, Singh U. 'Nevi of Ota: the unusual birthmarks': a case review. BMJ Case Rep. 2013 Mar 1. 2013:[Medline]. Adameyko I, Lallemend F, Aquino JB, Pereira JA, Topilko P, Müller T, et al. Schwann cell precursors from nerve innervation are a cellular origin of melanocytes in skin. Cell. 2009 Oct 16. 139 (2):366-79. [Medline]. Davies H, Bignell GR, Cox C, et al. Mutations of the BRAF gene in human cancer. Nature. 2002 Jun 27. 417 (6892):949-54. [Medline]. Pollock PM, Harper UL, Hansen KS, Yudt LM, Stark M, Robbins CM, et al. High frequency of BRAF mutations in nevi. Nat Genet. 2003 Jan. 33 (1):19-20. [Medline]. Van Raamsdonk CD, Fitch KR, Fuchs H, de Angelis MH, Barsh GS. Effects of G-protein mutations on skin color. Nat Genet. 2004 Sep. 36 (9):961-8. [Medline]. Van Raamsdonk CD, Bezrookove V, Green G, Bauer J, Gaugler L, O'Brien JM, et al. Frequent somatic mutations of GNAQ in uveal melanoma and blue naevi. Nature. 2009 Jan 29. 457 (7229):599-602. [Medline]. Van Raamsdonk CD, Griewank KG, Crosby MB, Garrido MC, Vemula S, Wiesner T, et al. Mutations in GNA11 in uveal melanoma. N Engl J Med. 2010 Dec 2. 363 (23):2191-9. [Medline]. Thomas AC, Zeng Z, Rivière JB, et al. Mosaic Activating Mutations in GNA11 and GNAQ Are Associated with Phakomatosis Pigmentovascularis and Extensive Dermal Melanocytosis. J Invest Dermatol. 2016 Apr. 136 (4):770-8. [Medline]. Shirley MD, Tang H, Gallione CJ, Baugher JD, Frelin LP, Cohen B, et al. Sturge-Weber syndrome and port-wine stains caused by somatic mutation in GNAQ. N Engl J Med. 2013 May 23. 368 (21):1971-9. [Medline]. Goldman-Lévy G, Rigau V, Bléchet C, Bens G, Muckensturm B, Delage M, et al. Primary melanoma of the leptomeninges with bap1 expression-loss in the setting of a nevus of ota: A clinical, morphological and genetic study of 2 cases. Brain Pathol. 2016 Feb 2. [Medline]. Hidano A, Kajima H, Ikeda S, Mizutani H, Miyasato H, Niimura M. Natural history of nevus of Ota. Arch Dermatol. 1967 Feb. 95(2):187-95. [Medline]. Quenan S, Strueven V, Saxer N, Laffitte E, Kaya G, Krischer J, et al. Pruritic acquired nevus of Ota. Dermatology. 2013. 227 (2):186-8. [Medline]. Mataix J, López N, Haro R, González E, Angulo J, Requena L. Late-onset Ito's nevus: an uncommon acquired dermal melanocytosis. J Cutan Pathol. 2007 Aug. 34 (8):640-3. [Medline]. Cho BJ, Kwon JW, Han YK, Kim JH, Wee WR, Lee JH. Cosmetic improvement of nevus of Ota by scleral allograft overlay. Can J Ophthalmol. 2011 Oct. 46(5):428-30. [Medline]. Tse JY, Walls BE, Pomerantz H, Yoon CH, Buchbinder EI, Werchniak AE, et al. Melanoma arising in a nevus of Ito: novel genetic mutations and a review of the literature on cutaneous malignant transformation of dermal melanocytosis. J Cutan Pathol. 2015 Aug 11. [Medline]. Martínez-Peñuela A, Iglesias ME, Mercado MR, Martínez-Peñuela JM. Malignant Transformation of a Nevus of Ito: Description of a Rare Case. Actas Dermosifiliogr. 2011 Dec. 102(10):817-820. [Medline]. Patel BC, Egan CA, Lucius RW, Gerwels JW, Mamalis N, Anderson RL. 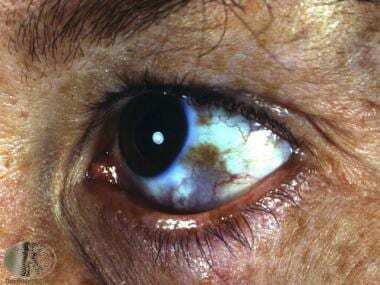 Cutaneous malignant melanoma and oculodermal melanocytosis (nevus of Ota): report of a case and review of the literature. J Am Acad Dermatol. 1998 May. 38(5 Pt 2):862-5. [Medline]. Chen YC, Chang CH, Hsu SL, Hsu MW, Lee CL. Malignant melanoma of the choroid in the eye with oculodermal melanocytosis of a Chinese woman. Kaohsiung J Med Sci. 2010 Dec. 26 (12):673-8. [Medline]. Gerami P, Pouryazdanparast P, Vemula S, Bastian BC. Molecular analysis of a case of nevus of ota showing progressive evolution to melanoma with intermediate stages resembling cellular blue nevus. Am J Dermatopathol. 2010 May. 32 (3):301-5. [Medline]. Qian Y, Zakov ZN, Schoenfield L, Singh AD. Iris melanoma arising in iris nevus in oculo(dermal) melanocytosis. Surv Ophthalmol. 2008 Jul-Aug. 53 (4):411-5. [Medline]. Toivonen P, Kivelä T. Unusual tumors involving the head and neck region: case 2. Malignant uveal melanoma in ocular melanocytosis. J Clin Oncol. 2001 Nov 1. 19 (21):4174-7. [Medline]. Infante de German-Ribon R, Singh AD, Arevalo JF, Driebe W, Eskin T. Choroidal melanoma with oculodermal melanocytosis in Hispanic patients. Am J Ophthalmol. 1999 Aug. 128 (2):251-3. [Medline]. Sharan S, Grigg JR, Billson FA. Bilateral naevus of Ota with choroidal melanoma and diffuse retinal pigmentation in a dark skinned person. Br J Ophthalmol. 2005 Nov. 89 (11):1529. [Medline]. Biswas J, Krishnakumar S. Choroidal melanoma in a black patient with oculodermal melanocytosis. Retina. 2003 Feb. 23 (1):126; author reply 126. [Medline]. Shields JA, Shields CL, Naseripor M, Eagle RC, Miller J. Choroidal melanoma in a black patient with oculodermal melanocytosis. Retina. 2002 Feb. 22 (1):126-8. [Medline]. Nik NA, Glew WB, Zimmerman LE. Malignant melanoma of the choroid in the nevus of Ota of a black patient. Arch Ophthalmol. 1982 Oct. 100 (10):1641-3. [Medline]. Mohandessan M, Fetkenhour C, O'Grady R. Malignant melanoma of choroid in a case of nevus of Ota. Ann Ophthalmol. 1979 Feb. 11 (2):189-92. [Medline]. Plateroti AM, Scavella V, Abdolrahimzadeh B, Plateroti R, Rahimi S. An Update on Oculodermal Melanocytosis and Rare Associated Conditions. Semin Ophthalmol. 2016 Apr 15. 1-5. [Medline]. Teekhasaenee C, Ritch R, Rutnin U, Leelawongs N. Glaucoma in oculodermal melanocytosis. Ophthalmology. 1990 May. 97(5):562-70. [Medline]. Radhadevi CV, Charles KS, Lathika VK. Orbital malignant melanoma associated with nevus of Ota. Indian J Ophthalmol. 2013 Apr 10. [Medline]. Wang BQ, Shen ZY, Fei Y, Li H, Liu JH, Xu H, et al. A population-based study of acquired bilateral nevus-of-Ota-like macules in Shanghai, China. J Invest Dermatol. 2011 Feb. 131(2):358-62. [Medline]. Shields CL, Kaliki S, Livesey M, Walker B, Garoon R, Bucci M, et al. Association of ocular and oculodermal melanocytosis with the rate of uveal melanoma metastasis: analysis of 7872 consecutive eyes. JAMA Ophthalmol. 2013 Aug. 131 (8):993-1003. [Medline]. Hirayama T, Suzuki T. A new classification of Ota's nevus based on histopathological features. Dermatologica. 1991. 183(3):169-72. [Medline]. Padilla-España L, del Boz J, Ramírez-López MB, Fernández-Sánchez ME. Camouflage therapy workshop for pediatric dermatology patients: a review of 6 cases. Actas Dermosifiliogr. 2014 Jun. 105 (5):510-4. [Medline]. Anderson RR. Lasers in dermatology--a critical update. J Dermatol. 2000 Nov. 27(11):700-5. [Medline]. Watanabe S, Takahashi H. Treatment of nevus of Ota with the Q-switched ruby laser. N Engl J Med. 1994 Dec 29. 331(26):1745-50. [Medline]. Chan HH, Leung RS, Ying SY, Lai CF, Kono T, Chua JK, et al. A retrospective analysis of complications in the treatment of nevus of Ota with the Q-switched alexandrite and Q-switched Nd:YAG lasers. Dermatol Surg. 2000 Nov. 26(11):1000-6. [Medline]. Wang HW, Liu YH, Zhang GK, Jin HZ, Zuo YG, Jiang GT, et al. Analysis of 602 Chinese cases of nevus of Ota and the treatment results treated by Q-switched alexandrite laser. Dermatol Surg. 2007 Apr. 33(4):455-60. [Medline]. Liu J, Ma YP, Ma XG, Chen JZ, Sun Y, Xu HH, et al. A retrospective study of q-switched alexandrite laser in treating nevus of ota. Dermatol Surg. 2011 Oct. 37(10):1480-5. [Medline]. Nam JH, Kim HS, Choi YJ, Jung HJ, Kim WS. Treatment and Classification of Nevus of Ota: A Seven-Year Review of a Single Institution's Experience. Ann Dermatol. 2017 Aug. 29 (4):446-453. [Medline]. Levin MK, Ng E, Bae YS, Brauer JA, Geronemus RG. Treatment of pigmentary disorders in patients with skin of color with a novel 755 nm picosecond, Q-switched ruby, and Q-switched Nd:YAG nanosecond lasers: A retrospective photographic review. Lasers Surg Med. 2016 Feb. 48 (2):181-7. [Medline]. Hosaka Y, Onizuka T, Ichinose M, Yoshimoto S, Okubo F, Hori S, et al. Treatment of nevus Ota by liquid nitrogen cryotherapy. Plast Reconstr Surg. 1995 Apr. 95(4):703-11. [Medline]. Disclosure: Serve(d) as a director, officer, partner, employee, advisor, consultant or trustee for: Valeant; Sandos; Cipher; Klara; Miramar<br/>Serve(d) as a speaker or a member of a speakers bureau for: Celgene; Cipher; Klara. Disclosure: Received consulting fee from Astellas for review panel membership; Received consulting fee from Amgen/Wyeth for speaking and teaching; Received honoraria from LEO Pharma for speaking and teaching; Received grant/research funds from LEO Pharma for investigator; Received grant/research funds from Galderma for other. Disclosure: Serve(d) as a director, officer, partner, employee, advisor, consultant or trustee for: Abbvie; Celgene;LEO;Janssen<br/>Serve(d) as a speaker or a member of a speakers bureau for: Abbvie;Celgene;LEO;Janssen<br/>Received research grant from: Novartis .